Hi there and happy Wednesday! The week is already half over and I still feel like I am recovering from the whole holiday hangover. I finally just got through all of the laundry that had been piling up. Our Great Room still looks like a bomb went off and that is certainly my next project to tackle. A Playroom for Jillian. I think the days of just keeping all of her toys in the Great Room basket are numbered. I don't want our Great Room to turn into a Toys R Us show room. Her toys are starting to get bigger and we are running out of space quickly!!!! 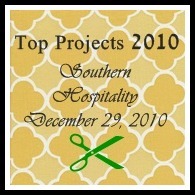 Speaking of projects, Rhoda over at Southern Hospitality is doing a link up party to recap your Top Projects of 2010. Since I am not super crafty or a home improvement diva just yet, I thought I would recap a few of the home decor improvements that I am most proud of this year. Now with the holidays behind us, I can't wait to get a jump start on my home decor goals of 2011! My Master Bedroom Evolution was definitely a work in progress for several years, however, this spring we finally had a finished room. We furnished our room with Wal-Mart's Canopy line and couldn't have been happier with it. My Restoration Hardware knock off bedding is still my most favorite thing in the whole room. I am still looking for a mirror and more wall decor for this room but it feels good to have it completely furnished. I love how Jillian's Nursery turned out and would like to do even more with it in 2011. I love how the 'J' vinyl decal looks above her bed, it's one of my favorite things in her room. My biggest home decor find of the year has to be the Sunburst Mirror that I found at TJMaxx/Homegoods. I had been looking on line for months for one and just happen to come across one at our local TJMaxx a few months ago searching for something else. It was love at first sight!!! I used my new Kitchen Island Apothecary Jars for two projects this year. One was for every day using fake fruit and the other was using Christmas ornaments for the Holidays. 1. Purchase entry way tables. 2. Finish the Great Room Curtains. 3. Convert the Den into a functional Den/Playroom. 4. New Kitchen curtains and valance. 5. Paint the Dining room a blue/gray color. 6. Paint the Powder Room Sherwin Williams Restrained Gold. 7. Purchase more wall decor for the Master Bedroom and Master Bath. Love your master bedroom decor! And can't wait to see your 2011 projects! I love a good makeover!! I love that mirror! And your master bedroom is a dream! I cannot wait for us to buy a home to decorate! Hi, Karen, what fun projects! Your master bedroom bedding is so pretty & your daughter's room is too. so cute! Thanks for joining the party, so glad you did. your master bedroom evolution looks fab-i just love that you called it that. i usually say revamp, b/c it's more of a changing process, so evolution is right on! Hey Karen! Your home is so pretty! My head is spinning with ideas, too. I just need some energy to make it happen. :) Seems like I can't drive a nail after G's bedtime at 8 pm, so that limits things too. Happy New Year to you! A playroom is on our list of "to-dos" in 2011! Our family room already looks like Toys R Us and it's making me CRAZY! You really did a lot this year! Apothecary jars are on my list of things to buy! I'm so behind on blogs after being gone for a week. I hope you & your family had a wonderful Christmas! I love the lamps in your master and in Jillian's room! Where did you get them? Both your master bedroom and your daughter's nursery are adorable. You must be so pleased with both. I can't get enough of Apothocary jars. The way that you used yours with fruit and ornaments looks very nice. Your master bedroom is so pretty and I love the apothecary jars. I'm needing to go get another one - my little 5 year old broke mine last week! I love your master bedroom. If you're looking for more decor items check out Old Time Pottery. My mother-in-law introduced me to the one in Myrtle Beach last year and the closest one in this area is Cleveland. Also the Flower Factory has some great stuff for low prices. And I think both stores are somewhere near each other in or around Parma. What fun projects! The nursery is so sweet and I love the sunburst mirror. TJX is THE best place next to Goodwill for stuff! Your home and all you have done to it are impeccable. Your decorating is welcoming and truly lovely. I love the master bedroom and you created a precious nursery too. Thanks for your kind words on my new weight goals and 2011resolutions. It was fun to indulge for the Holidays but now it's time to get serious once again. I'm ready. How nice I'm one of your top referrers. That is neat-o! I don't think I have been told this by any other blogger before. I should display mine as well. Your bedroom looks so beautiful and your daughter's room is adorable! I have that same bedding and love it! Everything looks fabulous!